​Unless you live in Massachusetts where it’s Patriot Day, today is Tax Day. If you’re just filing your taxes now, you’ve realized just how much the Republican Tax Scam screwed you over. Sure they raised the standard deduction, but they’ve taken away most of your itemizations through limits. We somehow managed to do okay despite our taxes rising by over one thousand dollars. In fact, married filing joint is only $100 less tax due than a single person making nearly the same amount. I believe the only reason we didn’t owe was because we were already having too much withheld. Our motto is live on less, so we can repair our house and car in the spring. We reached our health insurance’s maximum out of pocket in 2018, and we still couldn’t deduct our medical. Or our taxes, mortgage interest, or the little we give to charity. Good thing we don’t give to charity for the tax deduction; we give because it’s the right thing to do when you have more than someone else (even if it’s not that much more). 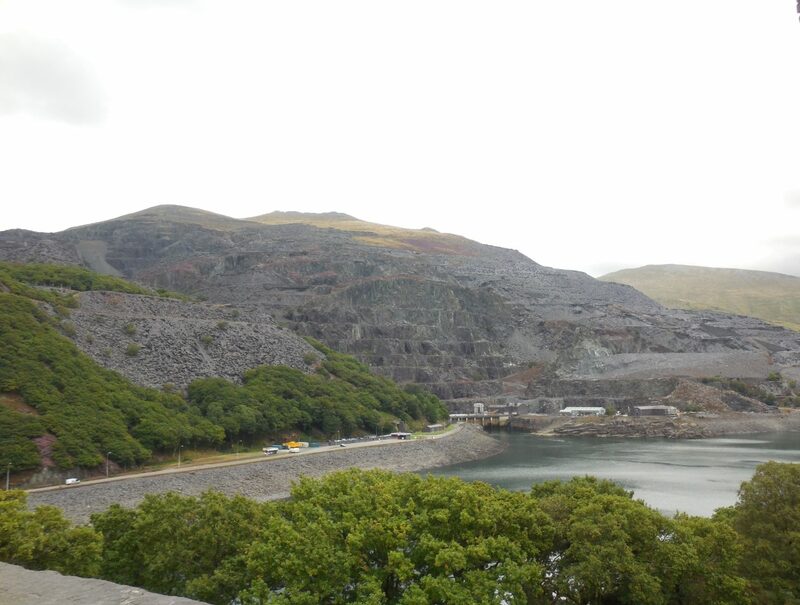 We have two kids at home and in school and one out on his own, and while he’s been pitching in with his own expenses for quite some time now, his moving out didn’t lower our expenses. He is still on our phone plan, our automatic toll payments, our AAA, our health insurance, and we don’t begrudge or judge him for any of those things. One, it’s cheaper for all of us, and two, it’s what a family does. One day I’m sure I’ll be on his phone plan. The main point isn’t that I don’t want to pay taxes; I do. It’s my responsibility as an American citizen to pay my share. What I don’t understand is how we allow the wealthy to avoid paying their taxes. I don’t understand how teacher are not allowed to claim school supplies on their taxes, but if you have a private jet, the gas is deductible. It’s absurd that we continue to allow this to happen. So that’s my rant. Despite it, my taxes were mailed last week, and with no savings, now we’ll struggle until our refund comes and I can pay back the private loan I took out, maybe I can get a pair of glasses that I’ve needed for over a year, pay for half of my hearing aids before they decide to send those to collection, but there will be no new roof (again, this is year 3 of waiting), no smooth driveway (which isn’t as luxurious as it seems – the more it sinks, the muddier it gets, the icier in the winter), no toilet in our upstairs bathroom (a necessity in a family of five), no oven for another six months to a year, no fridge which should have been replaced when we moved in and were lied to about its age. We have it good, but it still hurts to say no to your kids for something as innocuous as a trip to McDonald’s or a candy bar for no special occasion. I don’t want to spoil them with European vacations, but it might be nice to take a long weekend to Niagara Falls or Washington, DC. I truly am grateful for what we do have, and appreciate how lucky we are, but sometimes it’s important to let the people who don’t understand “real life” know what is going on in most of America – your neighbors, your friends, your kids’ classmates. I wish the Republicans in Congress would see this, but I’m not sure they’d care to be honest. I’d like to close this with a link to a 2014 article that is still relevant today about how the realities of living inn bootstrap America and how most daily annoyances are catastrophic for many people living paycheck to paycheck. 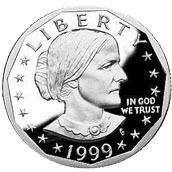 ​One hundred ninety-nine years ago today, Susan B. Anthony was born into a Quaker family in Adams, Massachusetts. Her activism began early at her family’s hearth as the entire clan was involved in the anti-slavery movement as well as temperance movements all throughout their lives. Her birth year of 1820 was coincidentally one hundred years before the 19th Amendment, giving women the right to vote, was ratified. I think we’re seeing a resurgence of this attitude if not the outright message. Coming to a head in 2017 with the #metoo movement, women are finding their voices and speaking out when they feel ignored or condescended to, which happens in all walks of personal and professional life. When the 15th Amendment was proposed and ratified (giving former male slaves the right to vote), Anthony was firmly against it, feeling that African Americans and women should receive voting rights simultaneously rather than continue to give men, regardless of race more rights than women. In 1872, she brought her Declaration of Rights for Women to the nation’s centennial in Philadelphia, wanting to share it at the official celebrations. Permission was denied, but Susan B. Anthony, leading a group of five women interrupted the speaker and handed the Declaration to the him. Leaving, she handed out copies to the crowd, and then found a public space nearby and read it to the crowd that had formed around her. 1872 was also the year in which Susan B. Anthony cast her vote. In doing so, she was arrested and brought to trial. Prior to the trial, she went around the county doing speaking engagements. Her speech was titled, “Is it a crime for a US citizen to vote?” At her trial, she was found guilty and ordered to pay a fine. She refused. Instead of the judge holding her in contempt, he declined any further action, and the fine has never been paid. She and Stanton were the first to lead the National American Woman Suffrage Association (NAWSA), and after the ratification of the 19th Amendment, the organization’s name was changed to the League of Women Voters, still a formidable voice for voting rights. 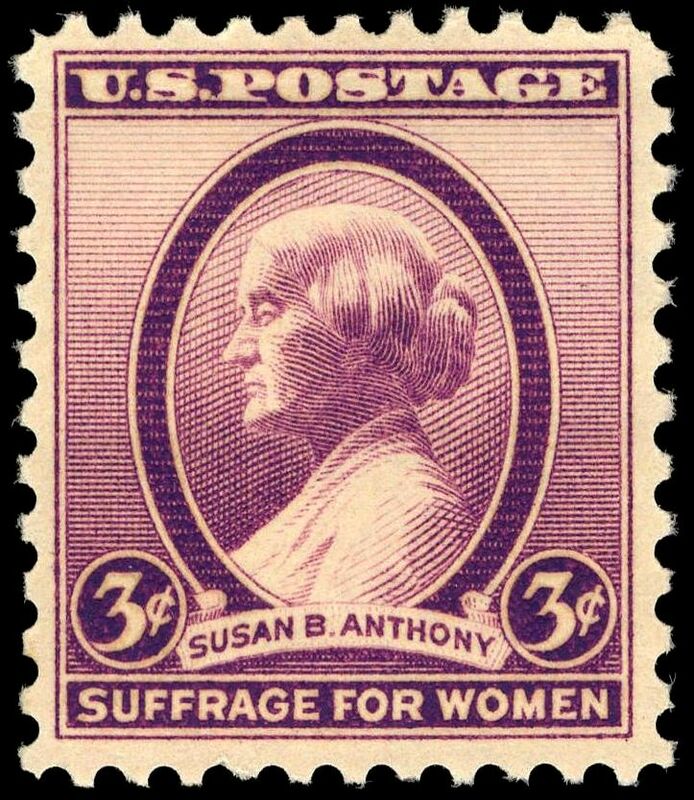 In addition to her house in Rochester, NY named as an historic landmark and her gravesite visited on many Election Days, most especially in 2016 when Democrat Hillary Clinton ran as the first woman nominated by a major party, she was also commemorated on a US postal stamp in 1936 and is the first woman to have her likeness on a US coin when her image was depicted on the dollar coin, first minted and released in 1979. In reading the title of her speech: Is it a crime for a US citizen to vote? it made me realize that as far as we’ve come, we still haven’t come all that far. We saw in 2016, an amount of voter suppression that many didn’t recognize in prior years. Some of it was so obvious as to be racist and sexist that it boggles my mind that it was allowed by officials and ignored by the media. The questions asked of Secretary Clinton, and the ridiculously higher expectations and almost impossible to meet standards expected of her in relation to her male opponents was embarrassing. Even more embarrassing is the way the media is currently treating the four women candidates for the Democratic nomination. I hear about Sherrod Brown’s ties to working class families, and reflection on Joe Biden’s status as elder statesman, and they haven’t even decided if they are running for 2020. However, Kamala Harris, Kirsten Gillibrand, Elizabeth Warren, and Amy Klobucher are being lambasted for listening to rap music, eating fried chicken, mocked for family lore, and treatment of her subordinates instead of where they stand on the issues. Is the idea that Amy Klobucher expects her staff to live up to her expectations more problematic than a President who lies constantly about everything, even the insignificant? Bill Clinton played the saxophone on television, Mitt Romney has a car elevator in one of his houses, former Speaker of the House Dennis Hastert is in jail for sexual misconduct, but no, let’s find out if Amy raises her voice trying to get things done. Journalism is in a tailspin, and I thought we were, if not past this sexism then at least pretending to be fair in public. Also standing out significantly is the Georgia governor’s race in 2018, the Voter ID laws that disproportionately affected the Native American population in North Dakota, also in 2018, closing polling places, shortening voting times, which thereby increased lines and eliminated the working class who can’t afford to leave work early or go in late. Deciding that polling places didn’t meet accessibility requirements for the general election even though there were no problems during the primaries, and those polling places that didn’t meet the requirements were in primarily African-American districts (in Georgia, where the Secretary of State who is in charge of those things was also running for governor. He won. Big surprise there.) There is still a congressional seat in North Carolina that has not been certified because of blatant fraud. So, how do we combat this? Should Election Day be a national holiday so more people can vote without losing time and money from work? Why do certain segments of political partisanship want less people to vote, not more despite their being eligible and wanting to vote? Should we have a standard set of questions to address to each office-seeker when they’re being introduced as a presidential candidate? Why do we continue to allow the Senate Majority Leader to lie about what the American people want (as shown in poll after poll), and allow him to not bring bills to the floor that have passed the House? Why do we allow the White House and the President’s enablers in Congress to block investigations into the Russian interference in the 2016 and 2018 elections? I would hope that no one wants a foreign power controlling our votes and who is elected to our national offices, but it seems that some of those politicians blocking access and investigatory avenues are dominated by their monetary reliance on that same foreign power. This is wrong. When will they come to their senses? When will their patriotism extend to real American sovereignty and equal rights instead of their false flag patriotism? How do we also encourage voting participation? Why do some from one side think it should be harder to vote, whether because of economics or transportation or accessibility? This needs to be addressed before the 2020 election. 2020 will celebrate the centennial of the ratification of the 19th Amendment. We should come together for a comprehensive overhaul of the registration and voting process to make it accessible to all eligible voters. If we wait much longer, we won’t have anything worth voting for. We all have choices that we make on a daily basis on what kind of life and world we are leaving for our children. One of my intentions this year is to be conscious of what I take in and share. This is more than a feel good story. Mainly, because there is nothing about any of this that feels good. A woman has lost her daughter. A boy has lost his parents (in a different way). And our country has lost its way. I can only hope that it’s not too late for any of us. ​Not sure if this is going to be longer later, but – I’m sad that George Bush 41 passed away. I’ve been listening to both the hagiographies and the realistic assessments of his presidency and public service career. Whatever else he was, he was a kind and decent person who cared about and loved his family and his country deeply. He had faith and beliefs that he kept in his heart throughout his life. He had a good sense of humor, and he made it okay for us to not like broccoli. He signed the Americans with Disabillities Act and when he was asked to intervene in pushing back the Iraqi regime out from their invasion of Kuwait, he acted. He forrmed a multi-national coalition including Middle Eastern/Muslim countries, and when their objective was done (Hussein going back to Baghdad), he didn’t push an imperialistic doctrine. He saw, and contributed, to the peaceful end of the Cold War after the 1989 fall of the Berlin Wall, including the reunification of Germany, which is likely one reason that Chancellor Merkel came to pay her respects. I didn’t vote for him, but I worked for him…kind of. I was a civilian in the Navy’s child development program. In addition to our regular group of military children under five, we were also joined by a couple of displaced kids when their parents were called up and their reserve units were activated during the Gulf War. Oddly, I was less politically active and vocal during Bush’s Presidency than just prior when I was in college and studying political science. When he pledged not to raise taxes, then got into office, and saw the reality of the economy, he took a leap (and it probably cost him a second term), and for the good of the country, he raised taxes. For the good of the country. He also closed military bases, which included my being laid off. At 17, after Pearl Harbor, he enlisted, volunteering for the Navy and was the youngest aviator. He was shot down over the Pacific. He then went to college, and over the span of decades was Congressman, ambasasador, director of the CIA, Vice President and President of the United States. A lifetime of service. A good man. This eulogized more than I had originally intended. The point I wanted to make is that if you’re waiting for someone who is unproblematic in order to eulogize them and offer condolences and respects upon their death after a lifetime of service, you may as well stop now. There is no such person. There will never be any such person. Even Saint Mother Theresa didn’t always believe in G-d, and she’s a saint. The point being that take a forward glance towards the future of state funerals and name the one, unproblematic one that we’re allowed to feel bad for, to admire, to want to emulate aspects of. They are all problematic to someone. That doesn’t dismiss the valid feelings they invoke, but it may need some additional perspective. George HW Bush was a decent man, with morals and he attempted to be better, not better than anyone or any of us or anyone around him, but just better. And in this world of Wisconsin Republicans overthrowing the duly elected incoming state government (is this the tyranny the NRA has warned us about? But that’s another discussion, isn’t it? ), we could all use a little bit more decent. In this time of holiday joy and generosity, please do what you can to support those organizations who help throughout the year. Scroll down to the Stands links for a collection of worthy charities, all of whom do good works. Add your own recommendations in the comments with how to reach them with donations and what their organization does.